Start by charging your Samsung Gear S2. When the light on the charger turns green, you’re finally (finally!) ready to start the Gear S2 for the first time. Hold down the Power button until you feel the watch vibrate; then release your finger. The Gear S2 logo appears on the screen, and you have to wait a few seconds more for the Tizen operating system to load. 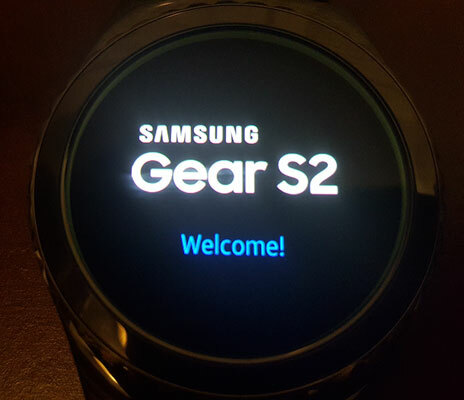 When the Gear S2 is finished starting up, you see the Welcome screen shown here. Welcome to your Gear S2. 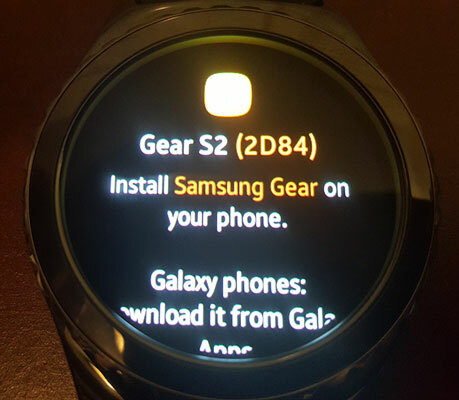 After you tap the screen, a message appears that asks you to install the Samsung Gear app on your smartphone, as shown in the following figure. Yes, you need to use an Android smartphone with your Gear S2. Even if you purchased your Gear S2 from a phone carrier so that you can make calls on your carrier’s network without a smartphone, you need to use the Gear Manager app on your smartphone to install apps on and manage your Gear S2. You can’t do anything with your Gear S2 until you set up Gear Manager on your smartphone. As of this writing, Samsung has preinstalled Gear Manager on its latest Galaxy S7 Android smartphone. However, if you have an older Android smartphone, you need to install the Gear Manager app. There’s also media chatter about a Gear Manager app for the iPhone as of this writing, so you may want to check the App Store on your iPhone to see whether the Gear Manager app is available now. You can’t do anything else on your Gear S2 after this point until Gear Manager is installed. The smartwatch screen turns off after 15 seconds.